You didn’t hear from me Last Monday and my apologies, but a case of family first I’m afraid. Actually saw a HEAP of rain whilst away, all down on the coast unfortunately, but the mums loved it, hey, no football no netball!!! Heaps of cars on the road today, coming back from St. Paddies races, no doubt a success as usual. 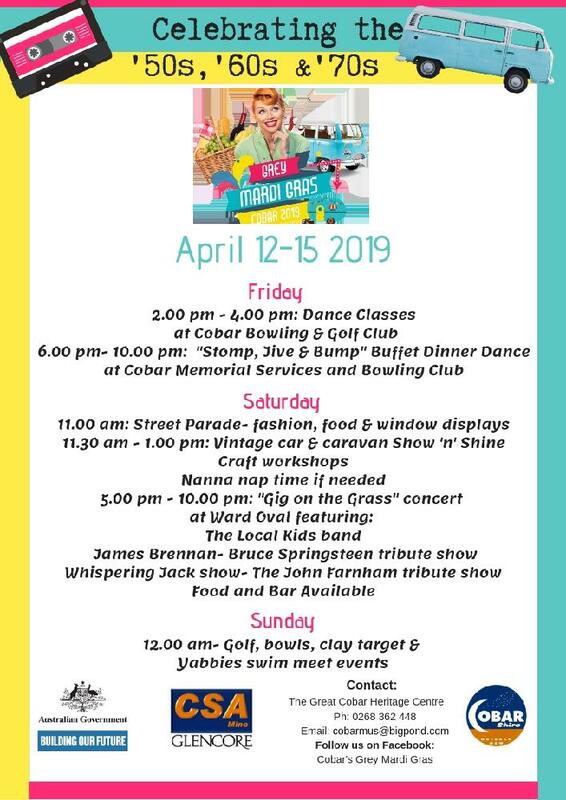 Nothing really has changed since my last epistle, but have to add the poster that I’ve attached, being the “Grey Mardi Gras” coming up in Cobar on the 12th -15th. April. Have a look at the poster, print it off if you will and spread the word. The Cobar mob are going to turn on some fun. Now don’t forget if you’re heading to White Cliffs the underground Motel is open for business from TODAY! Also up there is the “One Day Closer” drought party on the 30th. Also in between if you missed is the Wagga Food and Wine Festival on the 23rd.and the Deniliquin Aero Club Spectacular” both on the 23rd. The 30th.also sees “Abba” performing in the Broken Hill Civic Centre, how good’s that. One for you in April, is the “Cobar Rodeo”, and if I go on further you’ll probably forget!! More for next week! Don’t forget our friendly radio stations either. ABC Broken Hill on 999, transmitting in Wilcannia on 1584. 2WEB Bourke on 585 and Wilcannia River Radio FM on 103.1. If your down in “the inside country” you can tune to Western Plains ABC on 657. There’s also half a speculation that we may get a wee bit of moisture this week too. I must also apologise there is no coffee shop in our little town now. A great pity, but unavoidable. Mind you, a great business opportunity for a couple who enjoy meeting people and a fantastic return on capital. Till we carry on again, have fun, make sure you do something you’ve never done before this week, who knows who you’ll meet! Cheers for now, Bill Elliott. Wilcannia Community Tourism Association.